As a leading full-service agency in Switzerland, Darwin Digital is a WordPress design and development company. Currently, WordPress is the most popular and user-friendly CMS system at the moment and powers 30% of all websites on the Internet. Our dedicated team is experienced in creating, managing and maintaining fully customised WordPress websites and blogs. We endeavour to create beautifully designed, fully responsive and scalable websites suitable for SEO. We can provide your company with the WordPress solution that fits your requirements and budget; from building fully managed systems to code updates. Whether you want to start your blog, an online e-commerce platform or web hosting, we ensure that our solution fits with your case. You want your WordPress website to stand out of the crowd with a unique visual and user-experience design! 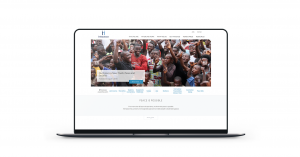 We have developed custom WordPress themes for SMEs, NGOs and multinational clients. Our UX and UI specialists have designed multiple WordPress lay-outs fully adapted and customised to personal taste. Our developers are specialised in WordPress and will build the best solution for you. WordPress can be extended to fulfil most of your needs, but if you have special needs or requirements, we also provide the option to develop a Custom WordPress Plugin. Our developers can extend existing plugins, or build a new, unique customised Plugin from scratch and fully adapted to your requirements. Existing WordPress Plugins can track your SEO, monitor your Online Marketing efforts and view insights on your Google Ads campaign. With Customised WordPress plugins you can add new features that are solely important for your company. With WordPress you can easily sell products and subscriptions by using different WordPress eCommerce Plugins. At Darwin Digital, we are happy to discuss with you what type of plugin extension you wish to apply. Our e-Commerce team has a vast experience in e-Commerce software, namely BigCommerce, Shopify, WooCommerce and Magento. Each platform has its own advantages and we are looking forward to sit down with you and explore the best fit for you. If you are currently using Drupal, Jumla or Typo and are wanting to migrate you existing site to WordPress, Darwin Digital will automate a lot of the migration process for you. We can also replicate the design and functionality inside a custom WordPress theme. Security on WordPress website is something we take very seriously. Our developers will systematically harden up your WordPress installation and server setup to reduce all risk of malign use or your website. Simplicity, SEO-friendly, flexibility are only a few reasons why WordPress is the World's favourite CMS! Our experts can tell you how to get the most out of your existing or new WordPress website.